With the Harry Potter film series being such a money making machine, having it come to an end in 2011 was likely not easy for the folks at Warner Bros - as a result, finding new ways to keep the franchise evolving, especially with the ongoing trend of shared franchises, must've been a...well, a must. Back in 2001, Rowling penned a small non fiction style book set in the Potter universe, Fantastic Beasts And Where To Find Them, under the pen name of fictional character Newt Scamander, which explored various magical creatures in the world she crafted. Now, over a decade on, a major film has managed to evolve from such material - scripted by Rowling herself and directed by long time Potter devotee David Yates. 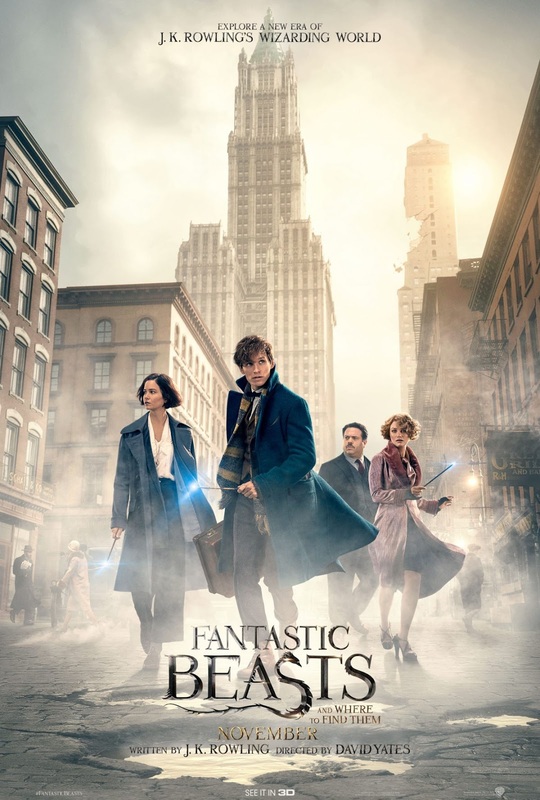 The main character is of course one Newt Scamander (Eddie Redmayne), who travels to New York in 1926 with his magical briefcase housing a number of unique creatures he seeks to protect and eventually write his own published works on. During his journey, however, behaviour of said animals and his brief conflict with muggles leads several to break free and escape into the city around them - with the aid of muggle Jacob Kowalski (Dan Fogler) and fomer aura Tina (Katherine Waterston), Newt must recapture the creatures before their collateral damage gets out of hand, whilst also helping to prevent a new evil that begins to rise during the chaos. I went into this film with sound expectations - and for me, there's a blend of positives and negatives, with the latter too often outweighing the former to the point of exhaustion and tediousness. The book of course has no real story - and so to develop a full scale blockbuster narrative out of it was not an easy task for sure. However, whilst I'd love to say an admirable job has been done, the film too often exposes these difficulties - with key issues being jarring tonal shifts, a generally dull narrative, weak villain, and a severely bloated run time. Character motivations also seem to be strangely mixed up in the latter portion, which is hard to fully explain without spoiling, but it essentially leads to some seriously forced scenarios that show how difficult it was to form an exciting climax for this story. It feels like two narratives are going on at once - is this about Newt's quest to capture his missing creatures or about the mysterious villain Percival Graves (Colin Farrell)? Said villain receives barely enough screen time and is seldom developed in an interesting manner that his role is mostly forgettable despite Farrell's best efforts, and so scenes with him feel like an afterthought. Rowling is also obsessed once more with injecting insane amounts of political themes into these stories, which is of course great to make her universe as authentic and complex as ever, but it can't help but feel monotonous when we're enduring legal matters in a film that can provide so much more colour and excitement. The comedy is generally good, as are the set pieces/slapstick scenes with Newt's missing creatures, but the shame is that these may be instantly followed by abruptly dark or deeply political moments that lead to immense shifts in tone and pace. The special effects are as good as ever, and the performances are strong despite weak character development, but the issue here is that it seems truly evident Rowling could not bring to life a compelling story from a simple non fiction-esque book. The fact that this will be followed by dozens of sequels and begin a new shared Potter film universe makes me uneasy when it gets off to a clumsy start, but who knows, perhaps some surprises await. As it is, this film stands as naught but a visually impressive, occasionally funny but otherwise dull and poorly paced disappointment, and I found myself itching for it to finish when there was at least an hour left - and said eventual hour did nothing to change my thoughts.